This is going to be a short review, reflecting the short nature of the test drive done with it. I got invited to try Peugeot 208 GTi, and because the waiting line of slobbering men wrongly convinced in their ability to control a car was somewhat long, my quota was a meager one third of an hour. So let's cut the usual prose and get down to business. 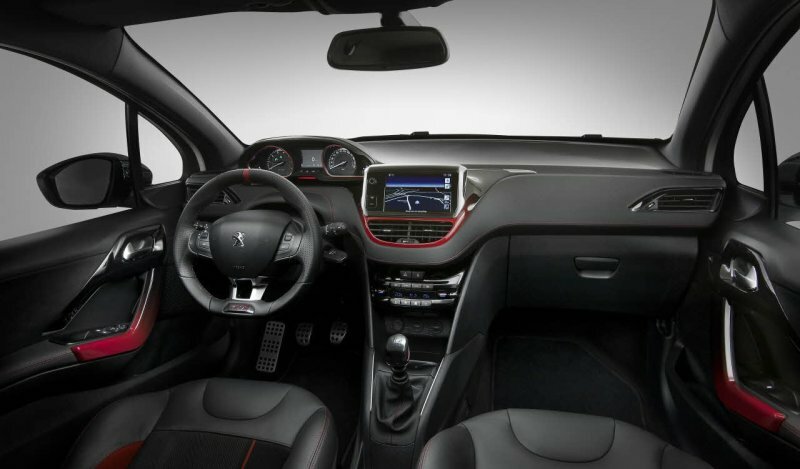 Peugeot 208 GTi is one of the most important releases for the company in the past two decades, promising to revive the glory of the 205 GTi legend, after two somewhat lukewarm attempts with previous models. The new vehicle comes with a chunky hatchback look, three doors, tons of equipment, a punchy 1.6-liter THP engine tuned to produce a very punctual 200 horses, and a gearbox wired for real men, with six slots and a pedal that must be depressed to avoid the crunchy sound of cogs. Understated punchy looks. Courtesy Peugeot media. I don't have any fancy pictures, so I will loan a couple from the official media center. It was a hectic experience, but I do promise real photos from my other 37-minute review of another sports car coming soon. Anyhow, Peugeot 208 GTi looks nice, especially in black. The exterior is slightly underwhelming, and on the inside, you get a very non-German attitude with rounded corners and tiered stacking of the dash and the multimedia screen, something that would have caused an OCD meltdown across the border, to the east. The default equipment level is good. You get alloys, leather seats and a leather-clad steering wheel, dual-zone climate control, touch-screen media plus navigation, and some more. Under the front hood beats a feisty unit that promises to propel this little hot hatch from 0 to 100 km/h in 6.8 seconds, according to the brochure. I liked, and then the sales representative let me pull out of the parking lot and drive around. Non-German lines inside. Curvy! Pleasant overall. Courtesy Peugeot media. Good: Engine noise is cool. Rattly, nervous, moody. Bad: The gear ratios are very short. The second one will only get you to about 90 km/h before you must shift, lest you hit the redzone and the limiter gives you a kick. Compare this to my SEAT Leon, which can manage almost 110 km/h in second. True, proper sports cars are tuned in a different manner, but a very handy long second one is always a great thing to have. Bad: Despite and possibly because of the sporty tuning, the engine is neither very elastic nor does it deliver the right dose of acceleration you would expect. Again, compare this to my Spanish lion. Its 1.8-liter engine can pump out some 250 Nm worth of torque at 1,500 rpm and upwards. In comparison, the Peugeot engine delivers 280 Nm starting at a slightly higher 1,750 rpm. To check whether this means anything, I tried climbing a steep, would-be control hill in the sixth, with the speed clocked at 70 km/h. At the end of this climb, my speed in Peugeot hasn't changed one bit, even though I'd given my best attempt to floor it. This is identical to what SEAT does in the same road conditions, despite its higher weight, lower engine rating by a whole of 40 HP and about 10% less torque. I was somewhat disappointed here, I must say. Bad: The steering feels too light. I was not comfortable doing the roundabouts at speeds higher than 40 km/h, because the front end was trying to take off. You don't get a good feel of the road, you think you're not in control. The car behaves, it did not skid or anything, the ESP did not have to kick in to compensate for my incompetence, but my own sensation was one of gentle frustration and not enough confidence. And then, my 21 minutes ended. 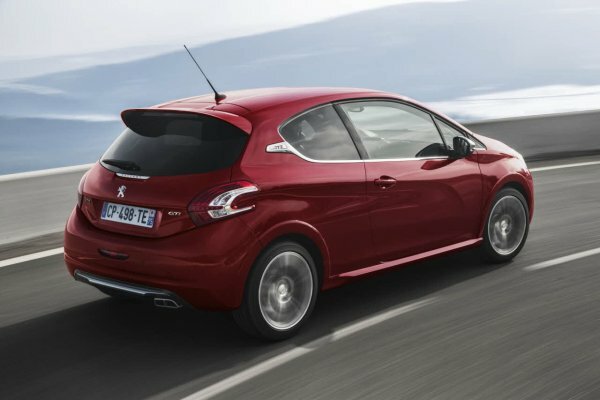 In my corner of the world, where driving Gold-plated Ladas is considered chic or something, no not really, don't be silly, Peugeot 208 GTi costs about 4,000 Euros more than SEAT Leon 1.8. For that money, you get one second off the 0-100 counter, negligibly more mid-range power if any, more or less the same equipment, but certainly less feel of the road. There's that. My expectations meeting the reality. But forget about Leon. If you've never driven an almost hot hatch, then you might like this French box of goodies. If you have, then the incremental improvements in speed and handling, maybe, might not offset the price, or worse, your expectations. Or mine. So, if I have to grade, then 7.5/10. Next, we will have a lightning-quick Octavia vRS review, hopefully followed by Opel Corsa OPC. That's Vauxhall Corsa VXR for the British among you. After that, we kind of go back to long-drive reviews and such, and we hop over to the American continent for a taste of what they have there. Cheers.